Many of people believe they have a food allergy because they react to a food in some way. However, most of the time it’s not an actual allergy but sensitivity to the food they are experiencing. A “true” allergy is where there is an IgE mediated immune reaction within the body. These allergies affect about two to three percent of the population only. An IgE allergy reaction can result in symptoms such as a rash or hives and can also be as drastic as anaphylaxis which is where the mouth and tongue swell along with constriction of the airways. People diagnosed with this type of allergy carry an EpiPen with them in case of exposure as extreme reactions are life threatening. An IgE reaction is usually noticed very soon after consuming the food. The most common allergy foods are peanuts, tree nuts, eggs, soy products, dairy, wheat, oranges, shellfish and fish. 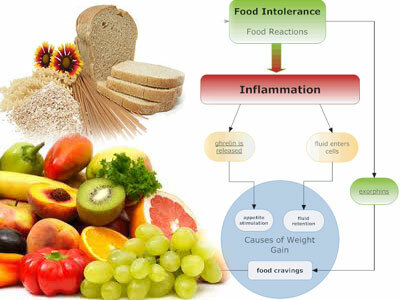 Food intolerance or sensitivity is where the body has developed an IgG mediated immune reaction to a food. This is where IgG antibodies are created in the body after it recognises the protein in that food as an allergen or “enemy”. Symptoms of food intolerances are wide and varied and can affect any of the body systems from digestive problems, skin problems, mood and behavior changes, respiratory reactions, muscle aches and pains and much more. Different from IgE reactions, IgG reactions can take some hours and sometimes up to a couple of days to surface which makes it even more difficult to determine without good food detective work. Testing for food reactions should start with IgE blood testing to check for true allergies to rule these out. Then a blood spot (finger prick collection) or serum (vein blood collection) test can be carried out for IgG reaction to foods. There is also another type of food intolerance test that I use and this is ALCAT testing. This is where a blood sample is collected (vein) and sent to the pathology laboratory overnight. The blood is then exposed to various foods and the reaction of the white blood cells are noted and recorded. The more active the white blood cells are the more of a problem that food is to the body. Sometimes this test is preferable as it reflects a reaction in the body to the whole food and not just the protein component. At the end of the day, aside from IgE test results, the tests for food intolerances are there as a guide. For example you need to be eating a good range of foods leading up to intolerance testing for the test results to be as accurate as possible. If for example you haven’t eaten a food for some time, that food is unlikely to present as an intolerance during the test because the body would not be recognising it as a problem. Although very time consuming and fraught with difficulties in social situations, strict food elimination for a time followed by single food re-introduction to “challenge” the body is the most accurate way to determine food intolerances. This method takes quite some time and persistence. Most people prefer to have results quickly and this is where food intolerance testing can really help speed the process. Because of this I use food intolerance testing in its various forms on a regular basis in my practice. My patients find it very helpful in pinpointing problem foods to reduce their symptoms from the outset. I find this approach along with detailed food-diary recording excellent for spotting problem foods or drinks to speed my patient’s way to better health. If you're having problems with foods and would like to discover which are the most problematic come and see me for a consultation. About once a year I teach a free seminar at Remede Wellness Medicine on how to eat, well, like me. I'm often being told how healthy I look and this makes people want to know what I do to keep that healthy glow. Eat a wide selection of various coloured vegetables and have one to two pieces of fresh fruit. Aim for at least three cups of vegetables per day with some raw. Balance on your plate - so have one-quarter of the plate filled with protein, half to two-thirds of the plate filled with veggies and salad, up to one-quarter of the plate with low GI starchy carbs (on the days you eat them) with a little good fat included. Aim to have one or two meals per day without starchy carbs though to keep your waistline trim. And, use smaller plates because it doesn't matter how big the plate, we all seem to fill it up and eat all the food. Include plenty of good fibre in your diet as this fibre feeds the beneficial bacteria in your digestive system and helps to prevent poor health, cancer and diabetes. Fibre choices can include: psyllium husks, slippery elm powder, chia seeds, pulses (legumes), whole grain low GI foods such as quinoa and brown rice. Address alcohol and caffeine. Have four alcohol free days per week and on the days you do drink, keep it moderate such as one to 3 drinks only. Bingeing in seriously bad for your liver, brain and health. Have just one to two caffeinated drinks per day and swap to green tea (which does contain a little caffeine too but you can top up the pot with hot water all day and still enjoy the beneficial polyphenols without the caffeine). Have your caffeine before 2:00pm each day so your sleep is not disturbed. Read labels and get to know what's in the food that you're buying. Keep sugars to less than 10g per 100g of food. Avoid trans fats. If you're trying to lose weight then keep to foods lower in carbohydrates. Nutrition labels will help you here. Eat like a nutritionist is watching. Recently we were on holidays for six weeks in Europe and it made me realise how difficult it can be when you're in "holiday mode" to keep track with healthy eating. Exercise on the other hand is a cinch! We were walking anywhere between six and 14 kilometres per day and, according to the health app on my phone, climbing from 10 to 50 floors worth of stairs per day. This is the joy of being a tourist in wonderful cities and towns in Europe, you can eat quite a bit and exercise most of it off. "Most" being the key word here. We still came home with some excess baggage around the waist. I really feel for people with coeliac disease who like to travel because that would be the most difficult to manage. Gluten-free choices aren't thick on the ground. While you can usually order a protein food with veggies / salad, you can't be 100 percent sure the chef or cook has avoided all gluten containing products. And, some people with this disease can be bedridden after consuming even a hint of gluten. As a matter of preference I avoid gluten food about 80 to 90 percent of the time and the only dairy food I eat is some grated parmesan or a little butter unless we are dining out or at friend's places for meals. During the holiday I noticed my digestion changed gradually over that six weeks from functioning very well to decidedly unhappy by the time we returned. It was an interesting experiment or one-person study to conduct and then consider in relation to the patients I see at the practice. Over that holiday time I was mindful quite often and ordered foods like grilled vegetables and octopus salad for lunches to try and rest the digestion somewhat. At other times we were on small boat cruises where the food was provided and plentiful. While you can give dietary preference information, there's something about being relaxed and on holidays where you get complacent about food choices and dig in with gusto regardless. If anything, aside from having the most wonderful trip to reminisce with my beloved over the years to come, it made me very aware of what everyone else, including my patients, experience while travelling or in their day-to-day busy and social lives. As soon as you return follow a healthy balanced low carb detox diet to help return your body to its former good health (that's exactly what we are doing now).